So, yes, Interstellar Overdrive plugs are chock-full of colour-shifting particles, like travelling though a stellar globular cluster at warp speed. Wahey! The colours change depending on light and angle, and they come in a variety of different colour combos -- blue to purple (pictured top-right), red to gold and purple to green-gold. 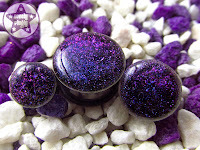 These plugs are available in sizes 6mm up to 24mm and are currently made-to-order (though I have it on good authority that the blue to purples will be in stock very soon). You can get the blue to purple plugs here, red to gold plugs here and purple to green-gold plugs here.